As part of its community outreach initiative Jelly hosted a streaming masterclass for Blackpool Carer’s young carers on the 24th of January. Over the course of the class the young carers were able to familiarise themselves with the Jelly studios and the equipment within. Blackpool Carers is an independent charity that provides a number services to support unpaid carers of all ages throughout Blackpool and The Fylde Coast. Jelly has a longstanding relationship with the charity, offering social media insights and attending Blackpool Carers events throughout 2017. Most recently Jelly’s Managing Director and Studio Manager attended the Blackpool Carers Christmas Party where they had the chance to meet the young carers personally and witness first-hand their passion for gaming in TheiBox gaming bus. Jelly’s streaming masterclass ran in conjunction with Young Carer’s Awareness Day, a day designed to identify and raise awareness of the 700,000 plus young carers across the UK. The masterclass worked two-fold to provide the young carers with a fun and interactive activity whilst also fostering an interest in broadcast and video production. Jelly’s streaming masterclass consisted of an hour and half afternoon session in the Jelly studios and covered the entire production process behind a typical gaming livestream. Thirteen young carers were invited to participate in a host of activities throughout the class. Each activity was designed so the young carers could put their own creative twist on the session and really make it their own. Following the questionnaire, Jelly enlisted the help of partner brand Ice Cream Uploads’ Graham Day and Toby Lee, to discuss live streaming in more detail with the young carers. Here they broke down the format of a live stream, covering each individual element such as introductions, audience engagement, and calls to action (such as “follow us on Twitter @IceCreamUploads”). Following this, they performed a mock live stream so the young carers could see how these components come together as a whole over the course of a stream. Afterwards, the young carers were encouraged to practice their own live streams in pairs or groups at each of the numerous gaming stations set up for the event. The young carers took turns practising on the main stage which allowed them to see what their very own live stream would look like in the flesh, complete with specially designed overlays and chat mechanic. The Ice Cream Uploads team remained on hand to offer direction, support, and answer questions throughout the masterclass. In addition, Jelly’s Technical Director Steve Treasure was present to offer insight into what goes on behind the scenes of a livestream. Steve walked the young carers through the technological side of things, explaining everything from the lighting and audio rig to the broadcast mixing deck. 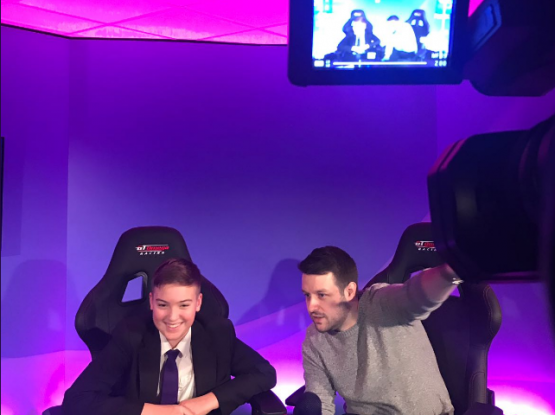 Throughout the masterclass it was clear that the young carers were familiar with a selection of streamers and broadcasters both within and outside of the games industry. The streaming masterclass gave them a taste of what it was like to produce a broadcast for a live audience and familiarised the young carers with the equipment and planning required for a professional level broadcast. Overall the masterclass worked to engage the carers vocationally with video production and provide them with a unique, creative activity which Jelly hopes will have sparked a passion for live streaming and broadcasting in all of them. Video is by far the most popular form of digital content amongst consumers with video generating 1,200% more shares on social media than text and images combined. From video marketing to broadcasts and live streams, Jelly’s in-house studio and team of production experts can help you create engaging, shareable, video content. Find out more, contact us on hello@jellymedia.com.